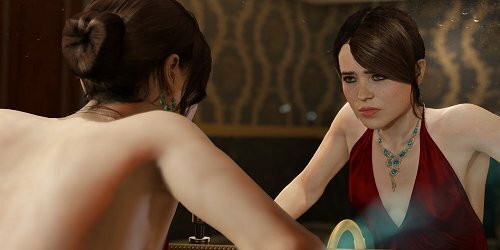 It’s a day late, but my post discussing Beyond: Two Souls is up on PopMatters. I wanted to expand upon a point I made in my review of the game, which was the anachronic nature of the game’s presentation. David Cage decided that it would be a good idea to present the story of this woman’s life out of order for some reason. At the end, an in-game fictional excuse is given for why the game is presented as it is, but it doesn’t matter as it doesn’t work in the real world with me as an audience member experiencing it. In fact, such a presentation seems to actively work against any deeper meaningful moments and the subtle crafting that allowed for it. I only go into detail about two rhyming moments and mention a few others, but there are plenty more both small and large, I didn’t get to that are wrecked by having their meaningful rhyme presented before the inciting element. I don’t fully agree with the accusations made against Cage. I do think his ego does get in the way of his work, but not in the way everyone else thinks it does. It’s like he has something to prove and that need gets in the way of his actual ability. And the more he compromises his vision with gimmicks the more people are going to rag on him, which only serves to perpetuate the cycle. So go ahead and read about the unfortunate mixup of Beyond: Two Souls.